As the summer heat settles in, a book full of beautiful cocktails is a welcome sight. In the new book from David Alan, Tipsy Texan: Spirits and Cocktails from the Lone Star State , there are classics as well as cocktails with new twists, and I want to sit in the shade and sip every one of them. I recently received a review copy of the book. I knew I was going to love it when I took a first flip through the pages and spotted a recipe for homemade Orgeat. I once went on a bit of an ingredient hunt for it, and in the future, I’ll be delighted to make my own. The recipes are categorized by style of cocktail like “Light, Bright, and Refreshing,” “Big and Boozy,” and “Sweet, Creamy, and Desserty.” And, throughout the recipes, there are technique tips, ingredient information, and a little cocktail history. The homemade Orgeat is used in a tiki-style, vodka cocktail called a Showgirl that also has passion fruit syrup, lime juice, and St. Elizabeth Allspice Dram. With lots of garnishes and crushed ice, it’s a pretty drink for a summer party. The Root Beer “Float” achieves its namesake look with cloudy absinthe poured on top. The Old Austin is an update on an Old Fashioned with pecan syrup, Angosturra bitters, and rye whiskey. One that I predict I’ll be enjoying frequently for the remainder of the season is the Hot Summer Night which is a mix of honey syrup, thyme sprigs, lemon juice, vodka, Paula’s Texas Lemon, which is our local limoncello, and natural lemon soda. First though, I had to mix up some Watermelon Mojitos. Muddling everything in a mixing glass makes this an easy cocktail to create. 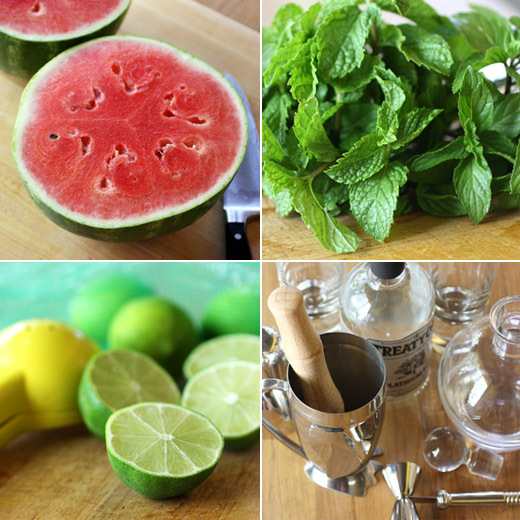 Watermelon chunks, mint sprigs, and some simple syrup were smashed with the muddler before rum, lime juice, and ice were added. The mixture was shaken until chilled and then poured through the strainer into an ice-filled glass. For cocktails, I like to crush ice by whacking it with a hammer after sealing it in a plastic bag and wrapping it in a towel. Last, it was topped with some carbonated water. Mint and lime wedges were added for garnish. Smashed fruit with mint and rum never fails to make a refreshing cocktail, and juicy watermelon is an ideal choice. The classic Mojito is also in the book along with a story about how dreadful the drink became when bartenders turned to mixes rather than using fresh mint. I’m inspired to sort through my liquor cabinet, add some new bottles, and shake and stir my way through all of these cocktail recipes. See this article for great information about Science-Backed Health Benefits of Watermelon. Recipe reprinted with publisher’s permissions from From Tipsy Texan: Spirits and Cocktails from the Lone Star State by David Alan/Andrews McMeel Publishing, LLC. Like most classic Sour-formula cocktails, the Mojito is an easy target for market-fresh improvisation. Any number or combination of fresh fruits can be muddled with the mint and other herbs to create an easy seasonal twist. My favorite such variation is made with watermelon, which to me is synonymous with summer and always in the refrigerator during its long season. Gently muddle three of the mint sprigs and the watermelon with the simple syrup in the bottom of a mixing glass. Add the rum and lime juice and shake vigorously with ice to chill. You may need to adjust the amount of syrup depending on how sweet your watermelon is. Strain into an icefilled Collins glass. Top with the carbonated water. Garnish with the remaining mint sprig and the lime wedge and serve with a straw. While a bottle of carbonated water from the grocery store will get the job done, I prefer charged water from a soda siphon. Bottled bubble water—especially in plastic bottles—tends to go flat quickly, whereas a siphon of charged water will stay perky in the fridge for a long time. More important, the water coming out of a siphon does so with force and invigorates the drink from the bottom up, as opposed to just sitting on the top of the glass. The standard soda siphon is reasonably inexpensive, and is definitely cost-effective in the long run. Simply fill the siphon with filtered water, charge with a CO2 cartridge, and refrigerate carbonated water. Refreshing and delightful! This is the only way I'd have watermelon (I'm not a big fan of that fruit). Wait until I show this to my beloved husband, the watermelon-addict! A perfect summer cocktail! Delightful! well, well, well doesn't this look incredible. And perfect for this weekend celebration. Pinned and hope to make soon. What a beautiful spin on a mojito!! Its perfect for summer! Great looking drink! A really nice and summery take on the mojito. Good drink, and it sounds like a good book - thanks. 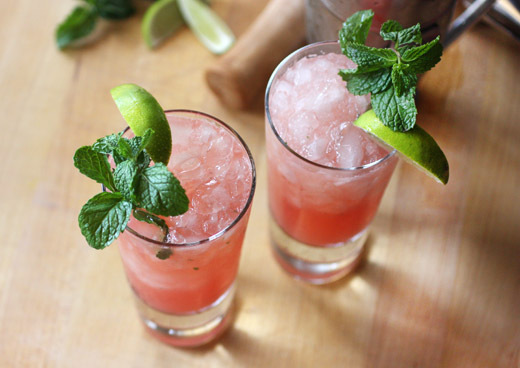 mojitos are SO refreshing, and a watermelon version would be doubly so! Wow! That looks refreshing and delicious....The perfect summer drink,Lisa! 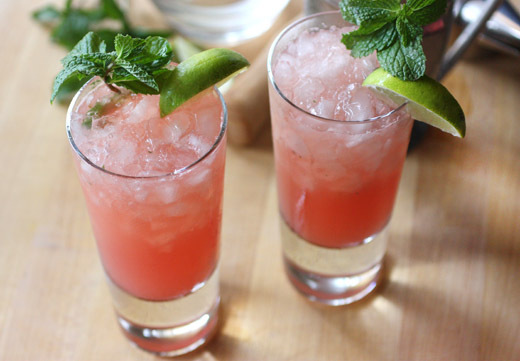 Watermelon mojitos are my favorite! I wish that appeared in front of me right this second. Love mojitos. Love watermelon. Perfection. Lisa, I love the color of this drink, so elegant...yes, mint sounds delicious with watermelon. What fun! And I'm crazy for watermelon too. Isn't that color marvelous? Nobody could resist a summer drink like this, Lisa. So cool and refreshing, only to look at the wonderful colors of the watermelon and the mint is already a delight. OMG... esperaré el verano a tener sandía lindo color,saludos y abrazos.